Most parents don’t think twice about the type of step stool they purchase. They’re busy with other things – feeding, bathing, keeping a tiny, hyper, lick-everything-in-sight human alive. But purchasing the right step stool for kids is vital. Why? Because they help to instill more independence and confidence in your child. Why Buy a Kids’ Step Stool? From making the potty comfortable to helping with handwashing, stools give the extra boost many kids require to conquer toilet training once and for all. Stools also act as a hygienic aid. And they support your child in brushing their teeth, getting into their bed easier, reaching their favorite toy (or cookies), and so much more. This product by iLove just might be something uLove. It comes in a 2-pack, allowing you to keep one stool at the toilet and another at the sink. It also has a dual height design, which is perfect for kids who are growing like weeds (those 80-dollar Nikes you just bought? They’ll fit for about thirty seconds). Some of the pros of this kids step stool include its durability and portability – it’s strong but lightweight. It’s also versatile enough to use anywhere in the house (if desired) and it’s made of non toxic materials. You down with PVC? iLove isn’t either! The stool has good grip too, providing kids with stability when they use it. In the cons column, the step is a bit narrow for some children. The height may be an issue as well – the stool proves too short for certain toilets. It may also be too short for small kids using it to wash their hands. Kids grow fast (as mentioned above), so some of these issue resolve themselves. This stool is designed to provide your kid with independence (“I am child, hear me roar. As I pee in potty, not on floor!”). It’s stylish, sturdy, and easy to move. It also holds up to 150 pounds, which makes it useful for some parents who are in the middle of toilet training. That bottle of aspirin on the top shelf of the medicine cabinet? This stool will help you reach it. Among the pros is the height – the dual height allows this stool to work for all kinds of kids (both those small and big for their age). The stool is also lightweight, but sturdy – it doesn’t tip over easily. And it’s a cinch to clean. Among the cons is that it looks dingy quickly – the grooves collect dirt, crud, and things you probably don’t want described. The steps may be too shallow for some kids and the base (while it doesn’t topple with ease) isn’t weighted enough to instill confidence in all parents. This stool is designed for kids to use for potty training as well as hand washing and teeth brushing. It offers a design that is sleek and stylish: it won’t be an eyesore in your bathroom. And it’s portable – take it along on your road trips! The pros include a versatile height and weight capacity, which makes it suitable for children who are a variety of ages and sizes. The stool doesn’t slip, either. This helps with independence as well as safety. The cons include size. Depending on the height of your sink, this stool may not be useful as an aid to hand washing (though it will still work with a toilet). If you have a vanity sink that sits higher than average, this stool likely won’t work until your child is older. This product is lightweight, strong, and stylish (a cool stool!). It’s versatile in and out of the bathroom. And its skid-resistance provides confidence as well as comfort. One of the perks of this design is that it works with higher toilets and elongated seats. This stool is also light enough for toddlers to carry themselves, perpetuating the circle of independence that’s necessary for successful toilet training. Kids like it for the freedom it provides. Forget mom and dad; they can do this on their own! The biggest con is that the stool isn’t especially wide. This limits the “turn around” space available. For kids who haven’t mastered stepping up a stool, turning around, and then sitting on the potty, a narrow stool can prove unwelcoming. This stool has a slip-resistant base and is sturdy, lightweight, and easy to carry. And it has a funny name – your kids will like that! The pros include its strength – parents have reported using it themselves without the stool giving in shape (though repeated use will likely cause it to falter). It also fits snug against the toilet, providing comfort for your child and protecting the floor from any wayward pee that escapes the bowl. And it’s very easy to clean. The cons include its height (or lack thereof): it may be too small for some kids to use at the sink (though it’s still suitable for the toilet). The platform may also be too narrow for kids who want more room. Some toes will hang off the edge if children have larger feet or are older. And the “turn around” space when used at the potty may be more cramped than desired. This stool is designed for potty training, but also for use in the kitchen, living room, or the tree-turned-pirate-ship in your backyard. It offers a sturdy and comfortable experience that works for most kids. On the “yay” side, the stool is well made and aesthetically appealing. It fits close to the toilet and offers a non-slip top that helps kids stay on the stool without fear of falling. On the “nay” side is the height – it’s shorter than the average step stool. This may compromise its ability to work at the toilet as well as the sink. Some feet won’t reach the stool while children are on the potty, which may make it a purchase to avoid if your child is small for their age or you’re starting potty training early. Sturdy? Check! Durable? Check! Lightweight and portable? Check! This stool is a nice addition to your toilet training needs. It’s also strong, holding up to 175 pounds. Among the benefits include its portability. Lots of stools are easy to carry, but this one? It has handles! It’s slip-resistant (at the top and bottom), easy to clean, and its height allows your child to sit flat-footed on the toilet. Kids can use it on their own, which helps foster their independence: they’ll be running your errands in no time at all! Among the negatives is the sticker across the top: it’s difficult to fully remove (if you decide you want to remove it). The stool is also a bit narrow and steep. Some kids may struggle with this. Some parents – as they worry about their children falling off – may struggle as well. This stool was the winner of the Mom’s Choice Award and is renowned for its safety. 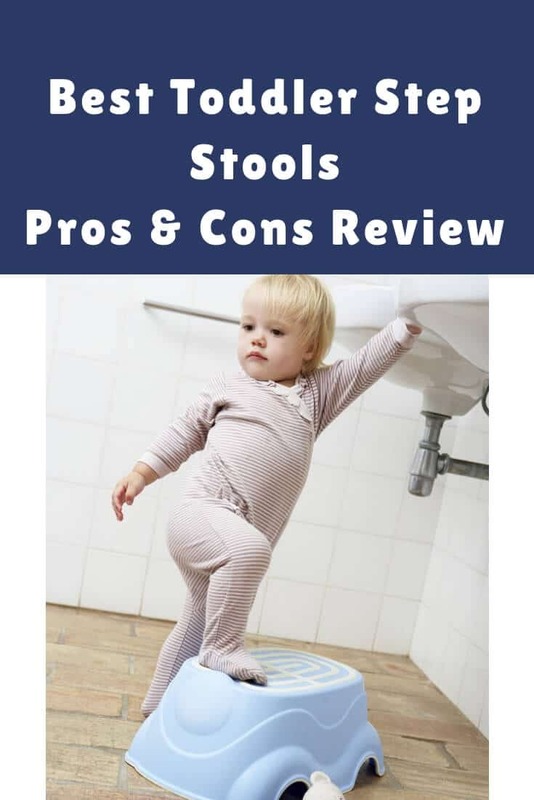 It comes with a free eBook (that shows children how to use the stool) and you can order it risk-free with a money back guarantee. Some of the pros of this stool include the aforementioned safety: it has upgraded anti-slip rubber pads so kids won’t slide. It’s also free of BPA and won’t crack or bend. It’s easy to transport with handles to help. And it’s versatile enough to work on the potty or elsewhere in the house. Some of the cons include the depth: the bottom step isn’t deep enough for every kid (especially if they’re smaller or younger). This may compromise independence and leave the child needing help. The above stools facilitate a comfy experience that provides your child with a sense of independence and accomplishment.